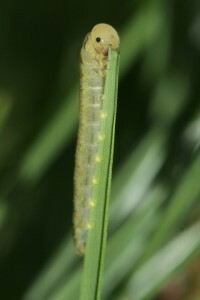 Sod webworms are a lawn pest which lives in turf and eats grass. In fact the adults don’t eat but its their young, small “caterpillar” larvae which do all the damage. 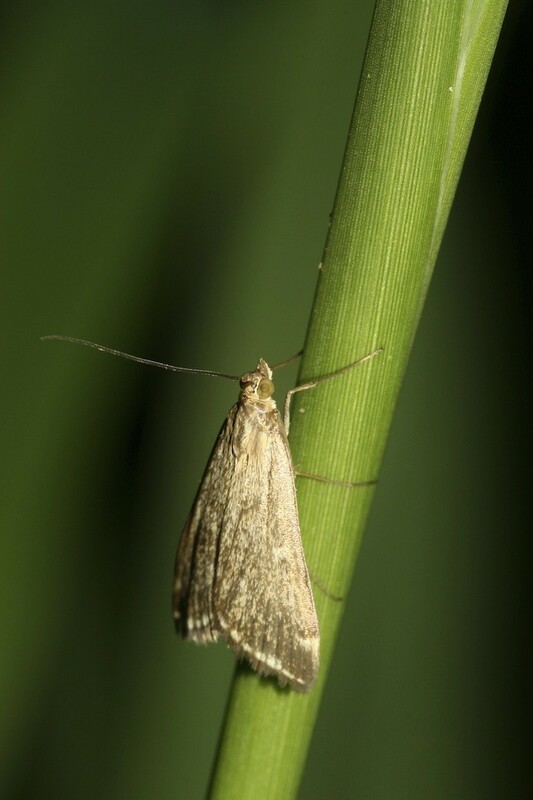 The adult sod webworm is a moth which likes to live it’s life in and around grass yards. 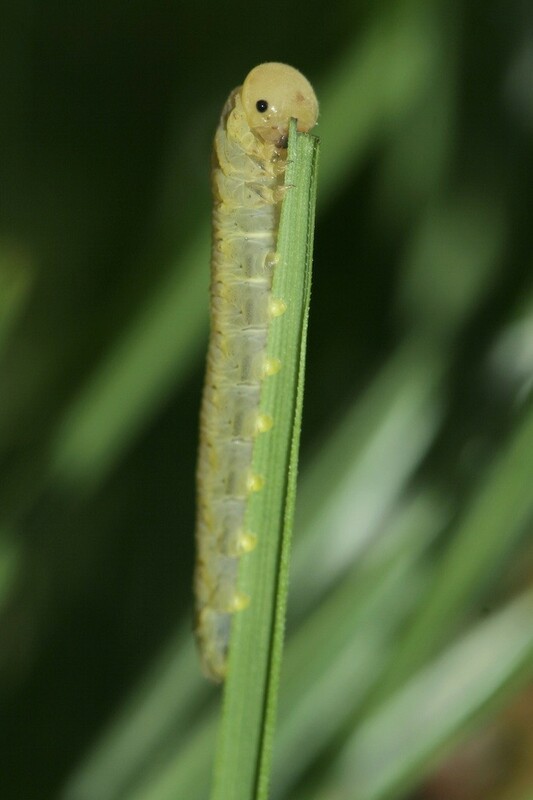 Once impregnated, female sod webworms will move throughout the yard and as they land in different areas, they’ll lay eggs which fall into the thatch of the lawn. There are several sod webworm species in the United States. Most will appear as clear to green when young and then tan to green as they age and grow up. This process will take just a few weeks but the larvae will start small and thin; maybe 1/4″ to 1/2′ in length. In a few weeks they will spin a pupae cocoon and hatch out into adults in just another couple of weeks. These adults will continue the webworm cycle by mating and laying eggs in the same areas. In the south, sod webworms can generate 3 generations a year. Up north there will be 1-2 cycles per season. At the end of summer, the feeding, young sod webworm caterpillars will go dormant in their pupae stage and hibernate during the winter. They do this down in the soil and there they’ll stay till the following spring. If left untreated, small population of sod webworms will grow annually until their impact will be noticeable one season. In the spring when they first emerge, it’s hard to see them but by late summer the damage they do will become noticeable as populations peak. BIFEN GRANULES should be applied first by spreading them out over the turf at the rate of 25 lbs for every 20,000 sq/ft. Treatments should be made every 2 months during the warm season starting in early spring. These granules are slow to release and will filter down into the ground a few inches where they’ll control sod webworm larvae and pupae as they hatch. These same granules will also get late season sod webworm caterpillars making their way into the soil to hibernate effectively stopping the cycle. 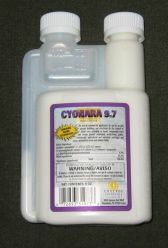 After applying the granules, spray over the top with CYONARA RTS. This active is highly active on a range of pests including sod webworms and will quickly kill off any active in the treated areas. Earthworms are not an insect so there is no direct way to kill off active populations. But you can repel them using a product known as Pest Rid. First, apply the Pest Rid Granules over the turf where you suspect they’re coming from. In this case, it will most likely be either side of your drive way. Use 1 lb of granules per 250 sq/ft and renew the application every 30-60 days for long term control. Next, spray over the top using Pest Rid Spray. This is essential to the process and will help get immediate results; the granules will absorb the spray and keep it active for 30-60 days. Please note: using the spray by itself will only be active 3-4 weeks and the granules used by themselves won’t help at all. In other words, you must use both in conjunction with one another for this process to work. Pest Rid uses all natural food grade actives to repel insect and animal pests so it won’t hurt anything. But by over exposing them to these actives, the worms will migrate elsewhere. I reside in Houston Texas, zone nine. It is now October, going on November. Is it too late to treat sod worms? I have a high infestation of moths! Treating now is important for several reasons. First, the moths you see are mating and right after that, they’ll start laying eggs. Failure to treat them directly now while their active will result in more egg laying in your turf. Second, it sounds like your yard has had previous activity? If so, there are larvae active even now. These are the ones that hatch from eggs and in general, they take several months to complete their cycle. So even if you don’t see them, there is a good chance some are active so again, treating them now will also reduce the amount of their activity. Lastly, because your yard is clearly “scented” with webworm pheromones, it will be attracting more moths to your property the rest of the fall. All these moths will be looking for a mate and then to lay eggs. To prevent this from happening, you need to treat. 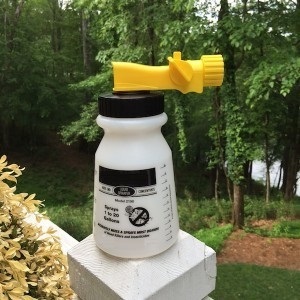 The spray will serve as a repellent keeping them away but it will also kill any that choose to stick around. And if you want the problem gone, plan on treating for the better part of a whole year. This means renewing the application every 60-90 days with the granules and liquid treatments listed above.